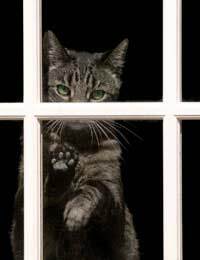 During the course of a year you will probably have hundreds of feline friends using your boarding cattery. The majority of these cats will settle quickly and stay healthy and happy until their stay is over and they are collected by their owners. Occasionally you may board a cat that pines, and this can be one of the most difficult problems that you will have to deal with. Often when a cat is boarded with you for the very first time it will show very different characteristics to those that it displays at home. The owners will tell you how loving their cat is, but you are faced with a nervous cat that hides in the corner and refuses to eat. This behaviour normally passes after a time, sometimes it takes 48 hours but usually the cat comes round and decides that nothing unpleasant is going to happen. You could be faced with a cat who is aggressive, sometimes this behaviour doesn't alter and you would need to be wary. As long as the cat eats and uses it's litter tray there is no cause for concern, but you may never be able to stroke or touch that animal. The worse case scenario is a cat who is nervous but not aggressive, hides in a corner and refuses to eat anything at all. This cat could be pining for home. In most cases the cats do not pine for their owner (even if they have a very close bond) but they pine for the normality of being at home in the surroundings that they have become accustomed to, and for home routine. This is probably the most difficult problem you will be faced with as a cattery owner. You will need infinite patience, firstly you will need to gain the cats confidence, you can only do this with gentle touching and quiet words. The main objective is to get the cat to eat. When you board kittens you might worry that they will pine. Most young cats, particularly kittens, settle quite readily into cattery life. They soon get used to your routine and show no sign of pining, the majority of them will thrive.